JUST ONE PIECE. Forming the focus of a new town house facade in Manhattan, this Italianate door header was carved from a single piece of limestone. Weighing just under two tons, it was fabricated from a block weighing over four times that. Monoliths can be very inefficient in their use of material, cost of installation and the risk they impose on the fabricator should the work be spoiled in production. The fabricator presented less costly alternatives but in vain, it turns out, and just as well. This intricately carved piece effectively unites its surroundings as only one big block of stone can. Photo courtesy of Dixie Cut Stone and Marble. Over the last decade, there has been a surprising and exhilarating increase in the number of clients who are eager to leave their permanent signature on the landscape and can afford to choose dimensional stone for their building projects. While the industry would never deliberately neglect such clients, projects can incur delays and cost overruns due to a chronic shortage of designers and installers with long experience in this traditional material. There is, however, one inevitable project participant whose career in building stone is necessarily long, constant and diverse. To discover strategies that allow the experienced stone fabricator to supplement the skills of others, as necessary, to help assure the smooth and uneventful progress of the stone project we talked to Steve Aspin, Vice President of Dixie Cut Stone and Marble in Bridgeport, Michigan. As a matter of course, the stone fabricator will consider issues which affect structural stability, installation and cost. The ability of designs to make spans and bear loads is sometimes not fully considered until the fabricator reviews the prints and addresses the matter. Additional engineering costs, redesigning and a consequent delay can sometimes be avoided by letting the fabricator review the design before getting the owner’s final approval. Consulting the fabricator about design details can sometimes save costs twice, first in fabrication, then again in the installation. For example, Steve Aspin recalls a recent design for a monolithic arch over a roof dormer window. Such monoliths are more costly to produce (see photo caption) and, again, more costly to install and engineer since they require the masons to put on a rigging operation. Offering to mitigate the costs implicit in this design, Dixie suggested ways to break the arch into five units and to disguise the joints. The fabricator can bring deep and varied experience to the design, early in the process, with the object of producing a result that is efficient and executable without delay or further redesigns. The fabricator can also furnish critical guidance for material choices, if consulted. Like wood, stone is a natural material varying considerably in its character and its ability to perform specific tasks in specific climates. An experienced fabricator accumulates perspectives on materials which permit the most accurate assessment possible of their likely performance. In addition, the quality of stone of a given variety will vary from quarry to quarry or even within a quarry over time as the bed is worked. Dixie sends representatives to visit significant quarries to monitor their capacities and to maintain good communications with these important partners. Material specification may be the most critical single decision affecting the outcome of the project. It is another subject on which the fabricator can be expected to have current information relevant to the success of the project. MATCHING HISTORIC STONE. 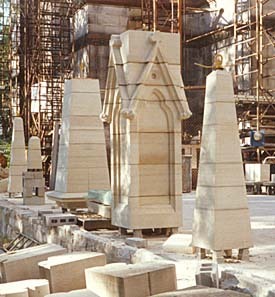 The fabricator located the original historic sandstone needed to make these Gothic replacement spires for a Connecticut church building damaged in a tornado. A broker’s sample led to a long abandoned quarry in Ohio, the original source for all the trim in the building when it was first constructed over a century ago. Dispatched to the wild and remote site, a quarrying crew was able to obtain matching blocks sufficient for the work. The fabricator is always thinking forward to the installation and will have to consider the experience and skill of the stone contractor. The object is to furnish a package that matches the peculiar capacities of the contractor. For example, a rigging company contracted to replace three five ton Gothic spires on an 1880 church building in Connecticut. 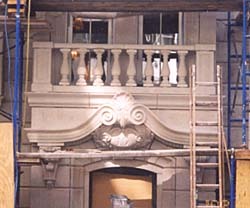 The fabricator did the take off, produced the designs, located the original historic material (see photo caption), carved the stone, assembled the spires, adapted them for a picking system, trucked them to the site for installation by crane and furnished a skilled field supervisor to make sure that they were properly installed. In this case, a contractor with minimal stone installation skills was enabled to successfully execute a demanding project by relying heavily on the services available from the fabricator. Most stone contractors don’t need this level of support for their masonry skills, and yet there is a whole spectrum of competence to address with regard to stone installation. Dixie’s field supervisor customarily confirms dimensions in the field, assigns a number to each piece, assigns it a location on a printed elevation, and then packs and palletizes the entire shipment for orderly installation. Some contractors are more capable of cutting and fitting work in the field, and such contractors will, of course, depend less upon the fabricator. Others will require the full package. As an example of the latter, Steve Aspin cites a new town house facade, in Manhattan, fabricated from Indiana limestone to blend with the period style of its historic neighbors. In this case, Dixie was working for the owner, furnishing a fully detailed package. When they contacted the contractor for direction in fitting the pieces for mounting, hoisting and anchorage, they discovered that the contractor intended to completely rely on Dixie’s expertise in the matter. A delay then ensued while Dixie engineered the project. If all team members consult together from the beginning, such expectations can become known and addressed early in the design phase. After the completion of the project, the fabricator will serve as an ongoing resource for future work of all types. Dixie keeps on paper and electronic file a fully detailed shop drawing for every piece fabricated, each keyed to a full elevation which is also on file, with samples of profile cutoffs in the actual stone. This archive can answer many questions governing future repairs and installations. They can fabricate any piece simply by knowing its location in the facade. They can identify the quarry location to exactly match the stone for replacements or additions. They can furnish anchorage details to resolve structural or systems installation questions. Even take off dimensions will be available from these documents. It is likely that they will remember or have notes on a broad scope of project details, should they become relevant again. These durable structures will be around a long time and it is likely that these archives will prove useful again and again. Should demand for building stone remain strong, the industry will in time develop a seasoned population of designers and installers with the experience necessary to meet any challenge with confidence. Even so, the fabricator is uniquely situated to experience the broadest range of problems and solutions and to address the full spectrum of concerns of owners, designers and installers. The stone fabricator will continue to enjoy a privileged and comprehensive view of the stone industry and to play an inside role in keeping projects on schedule and within budget. This entry was posted in Stonework and tagged Connecticut, Indiana Limestone, Michigan, New York, Stone Fabrication. Bookmark the permalink.